Sudha in Nepal helps boost her family's small earnings from farming by working as a stone crusher, providing material to build roads near her home - a job she began when she was 12. Her job helps lift her family's income to a combined 1,400 rupees, or $20 a week. She'd prefer to be at school, but now believes it is too late to start her education. When asked why she continues to do the dangerous work, she says simply: "There is no alternative." Sudha is one of an estimated one million children who work in small-scale mining and quarrying across the globe, the International Labour Organization (ILO) says in a report released to mark World Day Against Child Labour on 12 June. The million children bring the total number of workers in small mines to 13 million, so the proportion made up by the young and vulnerable is relatively small. That, insists the ILO, makes it a realistic target to eliminate such practices. Doing so is urgent. 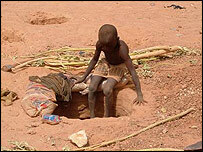 The children work in unregulated conditions, are forced into tiny tunnels to lug loads heavier than themselves. Dangerous surroundings mean they also risk serious illness and injury from explosives and toxic chemicals. 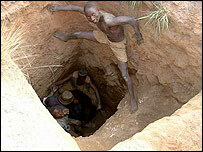 Those involved in such small mines endure a subsistence lifestyle. ILO mining expert Norman Jennings says that although there has been some improvement in the industry, consumers, governments and employers cannot afford to become complacent. "We want people to be aware that a significant part of the mining industry is not well-run, formal mines," he says. "More people work in small-scale, artisanal mines than larger ones, even though small ones produce less profit." 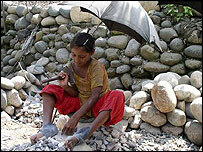 However, some big mining companies have already helped curb the practice of hiring child workers in many areas. "Bigger companies reach out to small scale miners, telling them how to deal with waste rather than polluting the local surroundings, and give them advice on analysing ore.
"Very basic things like that can make a big difference to whether people make a profit or not." Yet, some companies, particularly in the gold and precious gemstones sector, still condone child labour, if only through the "back door", Mr Jennings observes. "Companies are really keen to let people know that children are not involved in cutting and polishing stones, but if you take one step back the stone is being dug out of the ground by children." Meanwhile, gold is mined in tiny amounts and sold to intermediaries for $5 to $10 a time - offering little profit or benefit to the miners themselves. The buyers then sell the gold to bigger firms to refine, or they smuggle it out of the country. There is no way to check whether that wedding ring or bracelet in the jewellers has been produced with the help of child labour, Mr Jennings adds. The ILO has long been calling for action from governments, employers, donors and trade unions, as well as local communities and other organisations, to eliminate the practice of using children, some as young as five, as workers in mines. Improving working conditions - providing money for machinery, checking health and safety laws are adhered to - can remove the need for child miners. "Big industry also helps in other ways, it builds schools, hospitals, provides infrastructure and makes sure children are not involved," Mr Jennings adds. Many governments are also stepping in. On Friday, 14 countries, including Brazil, Colombia, Ghana, Togo, Pakistan and Senegal, signed an accord committing themselves to eliminating child labour in all small-scale mining and quarrying. But the ILO also warns that young workers cannot simply be removed from the equation; their families need to replace the money they would bring in, hence ongoing assistance is needed.